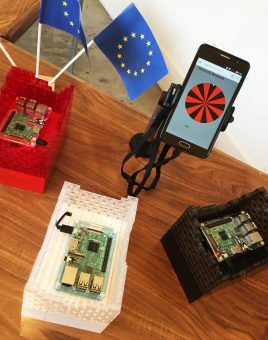 Mazi project partners at Edinburgh Napier University have developed an interactive demo exhibit, titled Network Roulette. The first public trial of the exhibit took place at the Whale Arts Centre in Edinburgh, UK, in late September as part of Explorathon 2017, Researchers’ Night Scotland. European Researchers’ Night is a European Commission initiative which gives people the chance to meet researchers and find out about their latest discoveries in more than 300 cities. The Network Roulette exhibit demonstrates how you can build your own WiFi network to share photos and media files with people nearby. 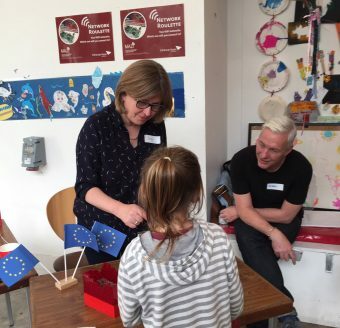 Explorathon is funded by the European Commission under the Marie Sklodowska-Curie actions programme. MAZI partners demonstrate a DIY WiFi network. This entry was posted in Events, News, unMonastery: nomadic. Bookmark the permalink. The Mazi project (2016-2018) has received funding from the European Union’s Horizon 2020 ICT CAPS initiative under grant agreement no 687983. Cookies are small pieces of data, stored in text files, that are stored on your computer or other device when websites are loaded in a browser. They are widely used to ‘remember’ you and your preferences. The cookie settings on this website are set to "allow cookies" to give you the best browsing experience possible. If you continue to use this website without changing your cookie settings or you click "Accept" below then you are consenting to this.